If your door has a lock like this, you can protect against burglars attacking the cylinder. Have you seen news and press coverage about the problem of burglars physically attacking cylinder locks to gain access to people's homes? Are you concerned about the security of your home or premises? 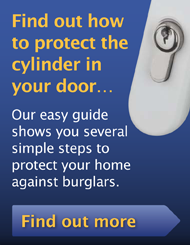 In response to the recent news and press coverage about the problem of burglars attacking cylinder locks to gain access to people's homes and premises, The Door and Hardware Federation (DHF) has introduced a new microsite to help anyone who is concerned about the safety of their home. How can I get that protection? To view the new microsite, via the DHF website go to www.dhfonline.org.uk and click on the lock cylinder banner advert on the right hand side of your screen. For further information please contact the DHF.